Did you know that our beloved Clague family were also pet owners? Old pictures and family stories tell us they owned both dogs and cats, while living on the Clague Road farm. Many years ago, it was common to have pets working on family farms in places such as Dover, now Westlake. Although most of our beloved pets are not working on farms these days, they are still a big part of our families. Can you imagine if Sophronia Clague were here today! She would enjoy seeing all the pets at the Clague House having their photos taken. 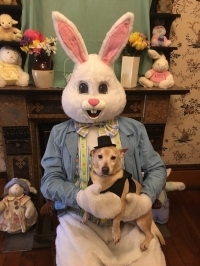 This month you have the opportunity to have your pet's photo taken, as the Easter Bunny returns to the Clague House Museum on Sunday, April 7, for pet photos from noon to 6:00 p.m. and on Tuesday, April 9, from 6-9 p.m. Grab your pet and make plans to hop on down to the museum, 1371A Clague Road in Westlake, to capture some special memories of your pet. Money raised goes to our community projects, children's programming and Golden Memories program for seniors. 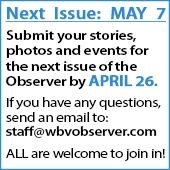 The cost is only $10, and you may also bring your own camera. Refreshments will be served. Please be sure to call us soon at 216-848-0680 to make your reservation. Reminder: The Spring Yard Sale will take place on Saturday, April 27, from 9 a.m.-4 p.m. on the lawn of the Clague House Museum. If you have any donations for the sale, please place them on the side porch of the house. You may call us to pick up your donations. Lysa Stanton is a retired special education teacher and the President of the Westlake Historical Society. She lives in Westlake with her wonderful husband, Dave and her awesome pets.